The mission of the Ministry of Health of the Republic of Cyprus is the continuous improvement of the population’s health through the promotion of health, the prevention of diseases and the assurance of the provision of quality healthcare services to all citizens, with respect to human rights and dignity. It is stated that the healthcare system in Cyprus consists of two delivery mechanisms: that of the public sector and of the private sector. The centralized structure of the public sector is financed by the state budget and is responsible for the planning, organization, administration and regulation of the healthcare services. Healthcare is provided by the primary healthcare centres and the hospitals under the direct control of the Ministry of Health, in the form of primary health care, specialists’ services, paramedical services, emergency services, hospital care, pharmaceutical services, dental care, rehabilitation and home care. On the other hand, the private sector which is mostly financed by the entrepreneurs’ pocket payments and voluntary health insurance is mostly in the form of independent health practitioners, private companies or partnerships between the doctors. Even though Cyprus’ health services are mostly considered of high quality, one of the biggest challenges faced by the public healthcare system includes its inability to offer universal coverage. According to current regulations, the majority of the population has the right to a free of charge access to public health services while the remaining population must pay in accordance to fee schedules set by the Ministry of Health. The General Health Insurance System (GHIS) which is now under consideration aims to provide universal coverage within a comprehensive health system. The latest roadmap for the implementation of the GHIS sets the starting date to the second half of 2015. Another challenge facing Cyprus healthcare system is the considerable disequilibrium between the public and private sectors, due to the lack of regulating base. One of the major challenges in the private health sector is the overcapacity problem mainly due to the existence of underutilized, expensive medical technology in this sector. Despite these challenges, there are no significant threats due to communicable disease and this is mainly due to the remarkable progress made in disease prevention, surveillance and control mechanisms. On the other hand, in relation to the identified threats and risks for non-communicable diseases, the Ministry of Health is implementing disease prevention and health promotion programmes. According to data from the Monitoring Unit of the Ministry of Health, the most common non-communicable diseases in Cyprus are prostate cancer among the male population and breast cancer among women. Another significant health problem in Cyprus is obesity. Nevertheless, many indicators suggest that the overall quality of the health system in Cyprus is producing excellent results. Basic health indicators, such as high life expectancy at birth, low infant mortality rates and low incidence of communicable diseases, rank Cyprus in high positions in EU-wide and international comparisons. Considering the health related Millennium Development Goals, Cyprus is taking decisive steps to reach this target. In general terms, it can be said that Cypriot population is in good physical health and most of the population is satisfied with the current state of the health services provision. However, the Ministry of Health of the Republic of Cyprus is fully aware that further development is necessary and this can only be achieved through the implementation of the new General Health Insurance System. The strong collaboration between the Commonwealth countries through sharing of best practices and experiences could even give an opportunity for the emergence of new ideas. And further cooperation among the Commonwealth countries could contribute to meet the Millennium Development Goals by 2015. Upon finalizing my message, as the Minister of Health of the Republic of Cyprus, I would like to underline our continuous efforts to create partnerships with all related stakeholders, to provide adequate training of health personnel and establish these initiatives that will enable easy access to the provision of adequate, high-quality health services to all citizens, on an equal basis. Finally, I would like to emphasize the importance of partnerships, like this one, Commonwealth Health Partnerships, in helping health systems to maintain their robustness and sustainability. 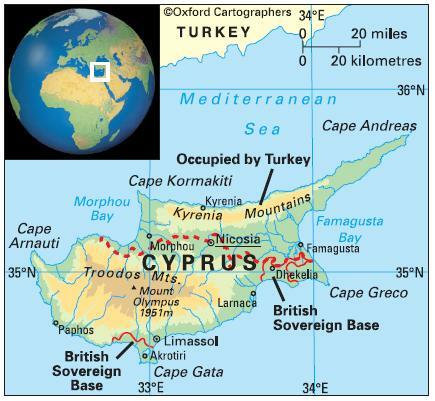 Cyprus is an oval-shaped island with a ‘pan-handle’ north-east peninsula in the eastern Mediterranean. Its closest mainland neighbours are Turkey (to the north), and Syria and Lebanon (to the east). Environment: The most significant environmental issues are limited water resources, due to lack of rain in the summer and pollution of the island’s largest aquifer by sea water; water pollution by sewage and industrial wastes; coastal degradation; and loss of wildlife habitats due to urbanisation. 1,129,000 (2012); 71 per cent of people live in urban areas. The population growth rate stood at 1.8 per cent p.a. between the years of 1990 and 2012. In 2012 the birth rate was 12 per 1,000 people (19 in 1970) and life expectancy was 80 years (71 in 1970). The population comprises Greek Cypriots (approximately 80 per cent) and Turkish Cypriots, and small populations of Armenians, Maronites and ‘Latins’ (the term used in Cyprus for Roman Catholics of European origin). The population of the occupied north was estimated at 257,000 in 2005, and included around 160,000 Turkish illegal settlers. Cyprus is classified as a high-income economy by the World Bank.